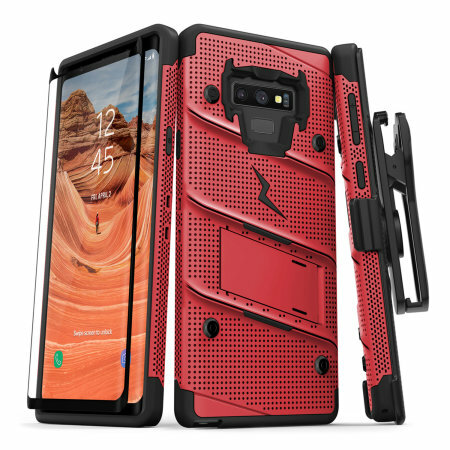 Equip your Samsung Galaxy Note 9 with military grade protection and superb functionality with the ultra-rugged Bolt case in red from Zizo. Coming complete with a tempered glass screen protector, handy belt clip and integrated kickstand. It arrived very promptly, packaged really well. I had one of these cases for my last phone it did the job very well. Virtually indestructible! Protects the phone well and the glass screen saver is superb, turn the sensitivity up on the phone and you wouldn't know it was on there. And it looks really cool!! Would have given more stars had there been the choice. Love this case, however the swivel for the holster seems so stiff that if I try to rotate it I'm afraid it will break off as I have seen in a couple of reviews. Well made, well fitting, robust and serviceable. I've had Zizo cases before and loved them. Quality and durability is fantastic. Plus the price is great compared to what you see at the stores. Can't beat the added bonus of the screen protector. However the screen protector adds hows fingerprints and smudges quite a bit and the curved edge of the protector, that fits the galaxy's curved screen, is a bit delicate as the case does not cover the edges. If it did you'd lose functionality but just an fyi the edges of the protector are easily cracked. I do wish I'd been able to track my order. Took quite a while to arrive. Not as robust as I imagined from the advertising and not even water resistant. Also the front cover is awkward to remove without pressing the phone volume button and the belt clip is on wrong side of phone case and does not rotate so it will break easily with normal bodily movement when working or being active. The case was easy to fit around my new phone. The glass screen was straightforward to fit, I was done in no time. Great product and except screen protector is not compatible with screen, touch screen is not working very well, so have removed it. Nothing wrong with the case. But screen protector is to thick and requires extra pressure on fingers. Screen protector ended up in the bin. I bought the product and had it for a week. Nothing wrong with case at all. But the screen protector is to thick which requires more pressure exerted on screen became annoying. So went in the bin. Big let down. This piece of kit is just very nifty. Very tough but the fact you can remove the lid make it practical. The addition of a proper slide out stand makes it even better. Top notch. Love the case, the stand is a little clunky to pull out, feels a little like it might break, wish the stand would also work portrait. The glass screen protector cracked when I lifted it slightly to remove a hair that was stuck under the corner. However the company have sent me a new one asap. The case is a really good fit and looks great. I've managed a to test it out a few times already having dropped it and it did what it was supposed to do. The sceen protection is an easy fit too. My husband love his case. The price was perfect and the workmanship is superb. I would recommend this case to anybody looking to purchase a case for their cell phone at a very good price. Perfect fit, even with a curved glass screen protector. The two piece case clips together securely and once closed leaves you with absolute peace of mind. I just wore this clipped to my left front belt loop on a roller coaster traveling at 74 MPH and thought the lap bar and G-forces of the ride might damage the phone....everything was perfect. It also comes with a quick detachable lanyard that you can loop through things for added security and worry free carrying. Far and away the very best case I've ever owned. I'd give it Six Stars if it was an option. This is my second time to order from you and I'm very happy with the items nise quality. The case is very stylish and the red colour is the right shade for me. The kickstand is welcome and I know it has been reported by other reviews on the internet that it breaks easily but I have not experienced this. Just understand the mechanism. The included glass screen protector is ok but the touch sensitivity of the screen is affected. To resolve this for the phone, I had to increase the sensitivity of the screen via the settings. The 4No. plastic dot bumpers on the back of the case is a disadvantage for me. It is smooth and provides no grip when placed on a surface. This results in the phone being easily moved, it should have a rubber inset to prevent this. Good all round tough case with good grip. Works with wireless charger & NFC payments. Compatible with Whitestone Dome Glass screen protector. Bought this case to protect my new note 9, it's really robust and does the job just right! Zizo Bolt cases on all my previous phones too. Great, good quality cases that look the part too.